Before there was Damien Hirst or Jeff Koons and their brand of self-aware, “meta” art that serves as both commentary and appropriation, there was Louise Lawler. Born in 1947, the photographer’s work focuses on challenging prevailing art worlds, and systems of aesthetics. Under the assumption that taste and style is merely a byproduct of institutional spheres of influence, her work is cheeky – always presented with a wink. Along with other greats like Cindy Sherman and Barbara Krueger, these art stars came to be known as “The Pictures Generation” due to an eponymous exhibition at the Met. Some of her best-known works include photographs of uniformed art handlers carefully transporting a Gerhard Richter painting (as if it were an holy relic, or a vestige of a lost culture) and a Damien Hirst spin-painting shown through a closet door. Jonathan Adler Smart Phone Dock: Cast in the shape of a rotary telephone, this porcelain docking station will keep a smartphone secure with a dash of old school style. Ore International Off White Ceramic Table Lamp: A simple, contoured design adds a decorative element to any room. Topped with cream-colored nylon shade. The MIAC Whirlwind Jute Rug in Natural/Iron: Made as part of an exclusive collection of handwoven rugs with Santa Fe’s Museum of Indian Arts & Culture (MIAC). Hand braided from handspun jute by artisans in India, the printed pattern is inspired by design elements from an early 20th century Native basket. Brick White Quilts and Shams by Villa Home: Welcome to the world of incomparable comfort, beauty and style. Enter an oasis of serenity: your bed, made with sumptuous Villa bedding designed to create a splendid haven, a place to escape the demands of everyday life. “Dream” Sparkler art print by Lucy Hodkiewicz: Everyone’s favorite summer activity, drawing with sparklers, expertly captured in an instant. Safavieh Bali Brown Nesting Tables: A transitional design and an easy-to-match brown finish. The table can be un-stacked to add extra table space when entertaining. Made in Indonesia; a piece of paradise in your home. To learn more about this artist, visit Artsy. My husband and I recently purchased a home in Brooklyn that was built in 1860. It is technically a “pre-pre-war” building, meaning it’s lived through the Civil War, and all of the World Wars. The Brooklyn Historical Society keeps amazing records on the evolution of city blocks, parks, and skylines. Perusing the digital collection, I was able to see what part of our new neighborhood looked like at almost every decade – the outdoor marketplaces, the children in backyards, the evolution of the subway system. This virtual timewarp essentially showed me that although my new home is almost 154 years old, its bones, original architecture, and facade have not changed so much. There is something fascinating about the fact that in 154 years, New York City and its boroughs can change so swiftly and yet, in many ways remain stagnant. The trim in our home is so similar to Guy’s that it is uncanny. We’ve also recently become obsessed with Victorian gilded frames, and the keeping of cloches and terrariums. Everything old is new again! 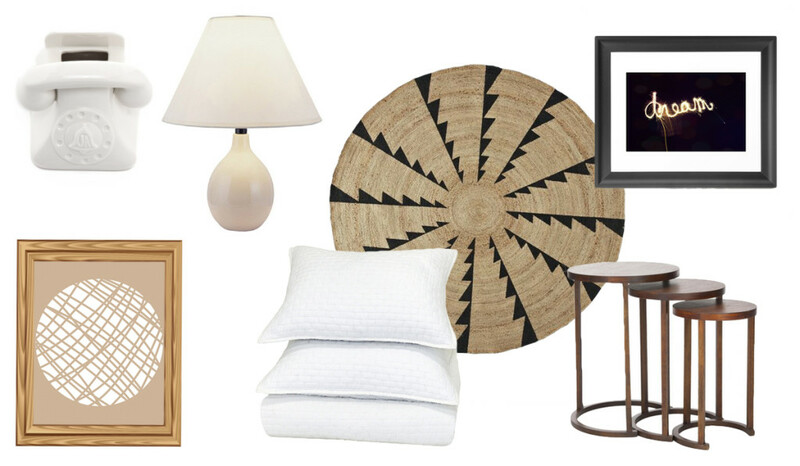 Look at those nail-heads on the mahogany chairs – are those not on trend for 2014? Even the chandelier with its cantilevers and pulleys can be found in stores ranging from Pottery Barn to Arhaus. The retro-futuristic Victorian fixtures are replete with decorative harnesses and pulleys echoing maritime mechanics It seems simple machines will always remain a basic of human existence. Guy, who was born and trained in England, settled in 1854 in New York. Typical of the time period, this highly-detailed “conversation piece” (a portrait with narrative elements) was commissioned by Robert Gordon in 1866. Three of the Gordon children have finished breakfast and appear to vie for a small corsage before setting off for school. 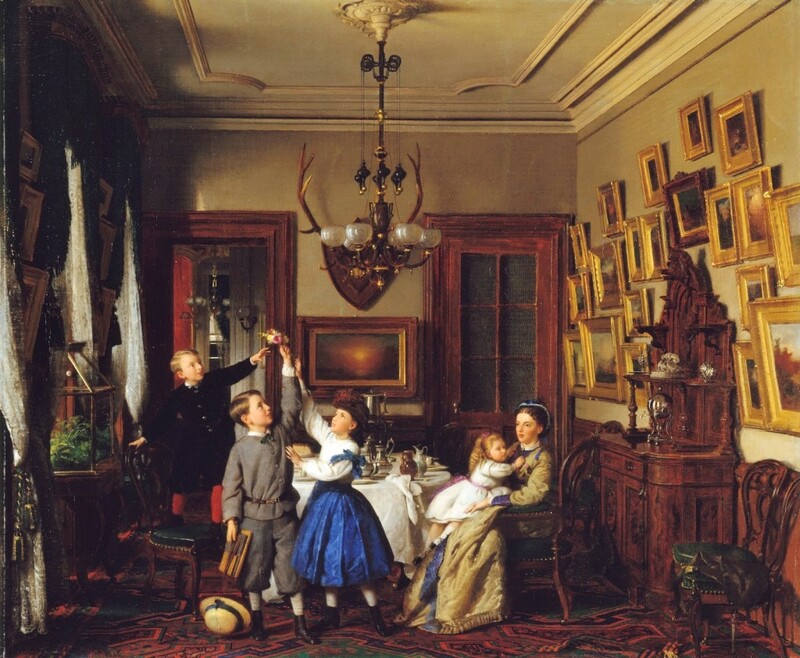 Gordon, a founding trustee of The Metropolitan Museum of Art, collected American paintings, some of which he displayed in the dining room of his home at 7 West 33rd Street, depicted here. The room was decorated in the up-to-date Renaissance Revival style. Of all the bedrooms of the eighties, the nineties and even the aughts, none invited more jealously than that of Clarissa Darling. Covered in scrunchies, littered with hubcaps, and filled with folk art influences (red patchwork quilts, hand painted chairs, mosaic tile dresses, tchotchkes), it was the perfect teenage girl’s escape. Even better? The show was credited with becoming the first Nickelodeon series to feature a female lead. Filmed in front of a live, studio audience. Nickelodeon Studios, Universal Studios, Orlando, Florida. State Archives of Florida, Florida Memory. The room was chaotic, and yet provided Clarissa the perfect amount of individual expression and zen. Boys were never allowed in, especially her little brother Ferguson (Ferg-Face). Dun dun dun. Exceptions were made for her platonic friend Sam, who would come in through the window to the sounds of a guitar riff. Her bedroom had backsplashes of pink and floral wallpaper, the remnants of a girl’s princess room. Yet, Clarissa decided to live in a hand-painted, graffiti splattered, mishmash of stripes, checks and chili-pepper string lighting. 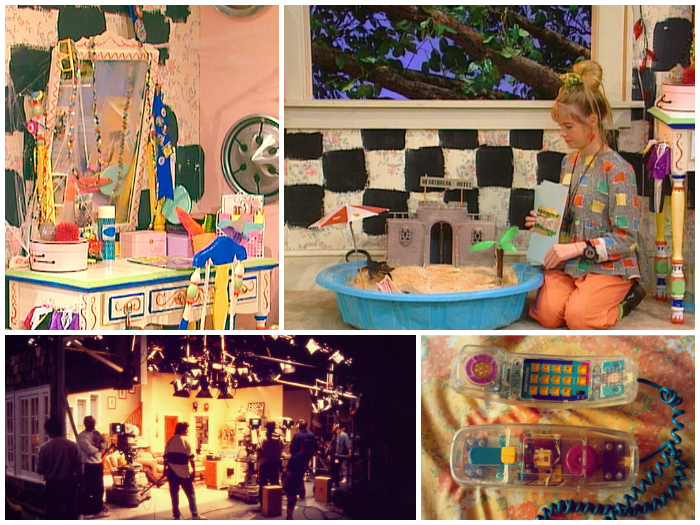 As much a part of the show as Clarissa’s personality, thank goodness the set-design did not succumb to typical, feminine stereotypes. 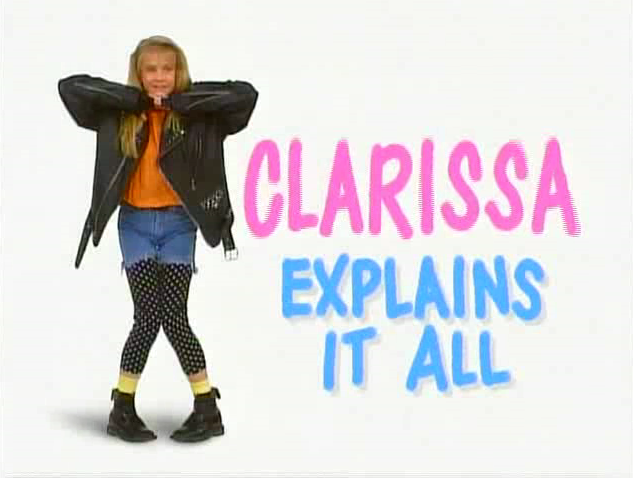 Clarissa dealt with normal adolescent issues such as first crushes, getting a driver’s license, sibling rivalry, bullying, grades at school, insecurities, shoplifting, experimenting with drinking, and confronting the issues of a inquistive teenager yearning for independence. She even played a lot of her mental scenarios out on a joystick, creating one-off DOS computer games, or in squiggly pie-charts on a “fourth-wall” whiteboard. 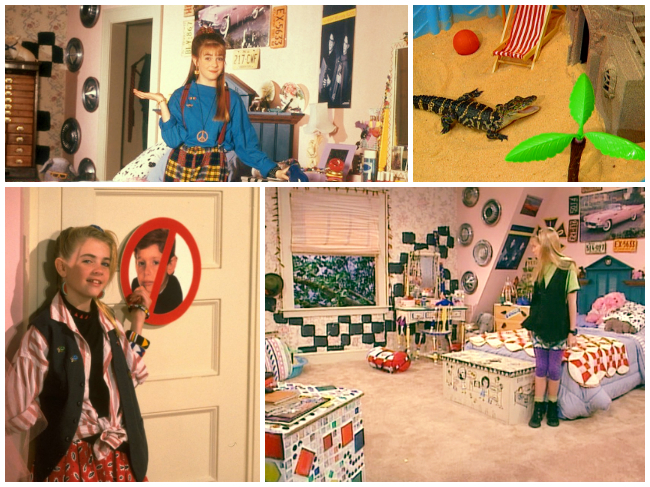 Clarissa was, and still is COOL. She mentions liking They Might Be Giants, Pearl Jam, and The Violent Femmes. She loves photography, sometimes wears ironic hipster glasses, digs Keith Haring and openly admits to believing in UFOs. She even had a pet alligator named Elvis! I wish we could meet, and be friends, today. To “tweens” from the early nineties, Clarissa is somewhat of a mythic, fairytale creature – the sister figure many never had. And how fitting, seeing as though the show’s creator, Mitchell Kriegman, named Clarissa “Darling” from J. M. Barrie’s Peter Pan. That was Wendy’s last name.